So it was late 2010, early 2011, I found myself scouring the internet for a new club to join. I had experience of different clubs around Leeds and not found the environment that supported new members. Sometimes stand-offish, sometimes downright rude. I had trained in Karate, Kickboxing (amongst other disciplines) what it seemed was an eternity ago when I had worked my way up grading’s at Bramley Freestyle later to become Impact Martial Arts. A long rest bite had found me out of shape and too many hours spent pouring over test cases and software releases. When a friend encouraged me to come along to Elemental Kickboxing, then based in a church hall in Headingly. Within the club I found the training regimen that would allow be to regain my long lost flexibility and maybe drop a bit of the poundage I had picked up along the way. Finding that intensive gym sessions were not working for me, only to find me increasing heft and reducing the ability to move my neck in the free weights area. Over the next few years, I attended more and more sessions, slowly kitting myself out and buying progressively larger bags to contain all the things I needed for my trips around the city to far flung locations. From scout huts, to poor staffed school gyms to places more akin to late 80s slasher movies, with the added feature of expired Chiroptera. 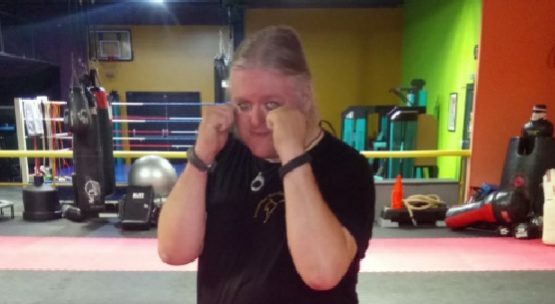 Through these times, I sweated and worked toward each next painful grading, by way of learning and practicing my technique and having successful and less pleasurable sparring sessions that taught me the old valuable lessons of movement and blocking. 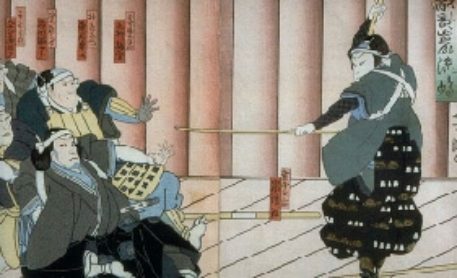 I watched as students of the club came and went, members attained their new belts, worked through injuries and difficulties, bonding as a disjointed family that came together every week attempting to punch and or kick each other in the face. 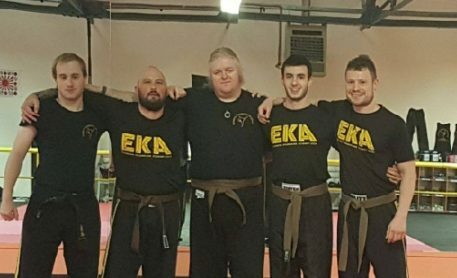 My first experience of black belt grading was watching Becky, Grant, Ian and Richard be put through their paces at the same hall in Headingly I had begun my club journey. Watching as the bedraggled quartet went through a number of hours of pain and suffering to attain that first step on ladder of the Dan. "In the months prior to that fateful Saturday morning, we as a group bonded over a shared pain to come". Pictured left to right: Tobiasz, Kris, Dale, Nathan, Keith. Little did I know that a couple of years later, I would be undertaking this ordeal myself, bolstered by Keith, Kris and Nathan, later in the proceedings Tobias who was added looking to attain his 2nd Dan. In the months prior to that fateful Saturday morning, we as a group bonded over a shared pain to come. We stripped back the clubs most extensive kata, to learn the entire 77 move beast over the weeks, we trained to makes sure we would still be standing at the days end and we took great delight in kicking the tar out of each other at every opportunity that we got. I can say looking back over this time that my journey in the martial arts truly began before I left school in various forms, took me through my teenage years to decide on what best suited me stylistically. But it is only now as a fully-fledged 1st Dan can I say that I have made the right decision and have felt the sense of achievement that goes with it. But as we are often told, attaining black belt is the beginning of a journey, one in which I can help those as my peers helped me. A burden not fully realized till you tie your black belt for the first time. The voyage so far has taught me to trust in my own abilities, that training focuses my mind (As well as being fantastic entertainment at parties) and that you can have tremendous fun, even when Nathan is shoeing you in the ribs.